Powers/Abilities: Gonra is probably about seven feet tall and is very strong (though not superhumanly so) and a highly skilled warrior and swordsman. He wielded a sword allegedly empowered by the Scorpion God. He also was good with spear throwing. 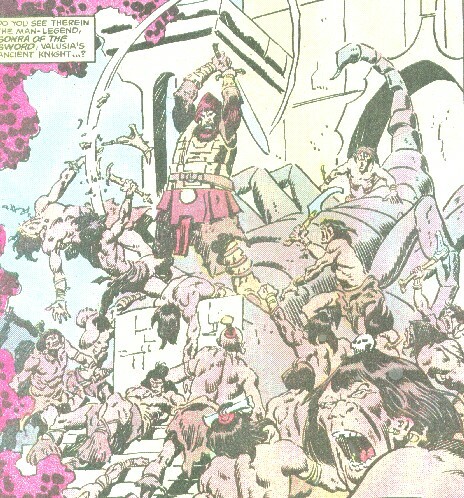 (Kull the Conqueror III#9) <19, 500 BC> - Gonra defended Valusia when it was invaded by Atlanteans seeking to slaughter the worshippers of the Scorpion God. Fighting off countless attackers, he saved the Temple of the Scorpion, but fell that day on a heap of slain barbarians before the shrine. Having bested the greatest warriors of his age, what more was there for him to do? He yielded first sword, then life. The Valusians lay Gonra to rest in the woods beside the temple. His sepulchre bore the image of his form, but his sword was hidden elsewhere, in a secret way. If the sword were brought to Gonra's resting place then--by a spell of the ancient priests--Gonra would awaken from his deathsleep. (Kull the Conqueror III#9 (fb) - BTS) - Time passed, and Valusia abandoned worship of the Scorpion. Gonra's tomb was long forgotten. (Kull the Conqueror III#9) <18, 500 BC> - With Brule having returned to his people, the Picts, Kull was left without a man to challenge him in combat, and he felt that he needed to be tested. Seeking to win the love of Kull, young Daphna Bora Ballin brought her friend Claudia to the cave of a blind sorceress. Conjuring forth images in her moongem, the sorceress told the girls of Kull's desire for a true warrior and then told them of Gonra and revealed the location of Gonra's sword. Daphna shared this information with Kull, but received instead an offer of jewelry. Kull brought his minstrel Ridondo to the abandoned Temple of the Serpent God, and Kull had visions of the sword's creation, fought his way past an army of demons (or perhaps it was illusion), and claimed the sword of Gonra. 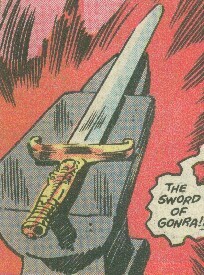 Kull and Ridondo brought the sword to Gonra's tomb, and Gonra awakened, angry at having been awakened from the sleep of ages and of being challenged by such a little man. Gonra and Kull sparred, Gonra with his sword and Kull with his axe, until Kull's axe handle shattered. Kull soon convinced Gonra to drop the blade and grapple as men, and after taking some beating, Kull managed to body-throw Gonra and then catch him from behind, stretching his neck backward. Threatened with having his neck broken, Gonra yielded. Kull happily proclaimed Gonra as a warrior peer and invited him back to his palace, and Gonra agreed, hoping to learn the manner of his resurrection. (Kull the Conqueror III#10) - Gonra accompanied Kull on a boar hunt, which resulted in a boar ambushing their hounds and then one of the huntsmen. Kull skewered the attacking boar and saw to his man, but then a second boar rushed from the woods, charging Kull from behind. Gonra hurled his spear into the beast, but it continued to charge, and so Gonra rushed forward, grappling the beast and breaking its neck. Gonra and Kull had quickly earned each other's respect and friendship, however, that night at the feast of the roast boar, two men in Kull's court manipulated him. 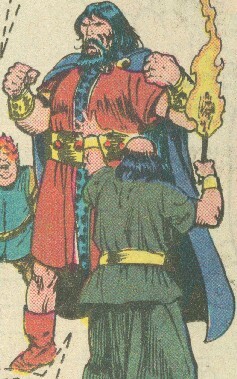 Duvario and Meicus fed Gonra large amounts of wine (possibly drugged), paying him back-handed compliments which made him think Kull disrespected him. Soon enough, they convinced him to pull out the sword that Kull had lodged in the Chamber of Ancient King Eallal, to prove his strength. The two men led the drunken Gonra to the Chamber, quietly dismissing the rumors that the Chamber was haunted in favor of gaining the gold contained within the room. With great effort, Gonra tore the sword from the door's lock, but Duvario and Meicus were soon slain by the Serpent Men and the ghost of Eallal contained within. (Kull the Conqueror III#10 (fb) - BTS) - Gonra apparently slew several of the Serpent Men himself, but was wounded. He fled through the halls to warn Kull. (Kull the Conqueror III#10) - Eallal slew Kull's royal guards and then attacked the king as well, but Kull overcame his magical assaults and drove him off. Kull soon recalled that he had locked Eallal in the chamber some time before and rushed down to check on it. (Kull the Conqueror III#10 (fb) - BTS) - Gonra found the Royal Chamber was empty and the guard slain, and so he rushed back to the Chamber of Eallal. (Kull the Conqueror III#10) - Kull found Gonra by the Chamber and entered it with him, only to have the door be slammed shut and to have Serpent Men attack him in the darkness. Kull slew the Serpent and was then attacked by Gonra, soon learning that this was not his friend, but rather another of the Serpent Men. 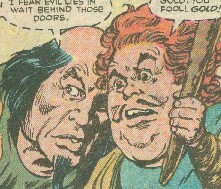 Kull slew the imposter, at which point the real Gonra broke down the Chamber door. 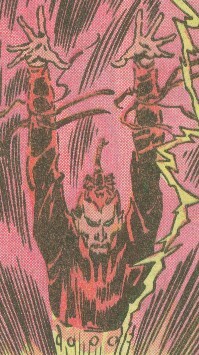 Having sounded alarm and summoned guards, Gonra confessed his actions and complemented Kull's victory over the monsters. Kull instructed his men to cleanse the room with fire and then seal it with brick and mortar. He then bid everyone else to return to sleep, and to "dream on airy trifles that might purge this night's bleak horrors from memory..."
Adapted by Alan Zelenetz, John Buscema, and Mel Candido. I don't know what ever came of Gonra. 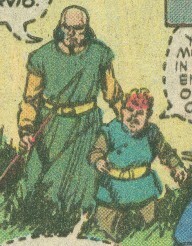 He seemed a promising character, but--though I haven't indexed a large portion of my REH comics--I don't think Gonra appeared after the end of this series (#10). If I'm wrong, let me know, because I have the issues to resolve it. Gonra's hair was red-brown in #9 and black in #10. It seemed to me that it might only have been the graven stone on Gonra's crypt that actually came to life. His crypt bore his image on the outside, and the being that came to life and fought Kull seemed to be on the outside of the crypt. other "moon" or "Gem" or "stone," characters, items, etc. The partner of Duvario, he deceived Gonra into opening the chamber of Eallal, though he did fear the legends of the Chamber being haunted. After Duvario was slain, he fled down the hall, only to run into the ghost of Eallal, which frightened him to death. When Kull approached the Temple of the Scorpion, the priest appeared to him in a vision, telling him how the Sword of Gonra was forged. It appeared as if the priest had originally forged the Sword as well. Kull overcame the demons summoned to test his mettle, and the demons and priest alike vanished...though Ridondo had never seen any of them in the first place. 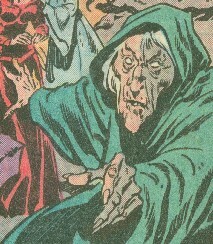 An old blind woman living in a cave, she took Daphna Bora Ballin's gold coins and told her that she could win Kull's pleasure by bringing him Gonra. She showed Daphna images in her moongem and told her where Kull could find the Sword of Gonra. However, not long after Daphna had a vision of Kull's death and she fell deathly ill. Her father's sorcerer told him that only the love of Kull could revive her. It is not clear whether the sorceress had anything to do with Daphna falling ill or not. "Fashioned out of Heaven's lightning...aye, fire of Heaven and the Scorpion's sting." It was forged some time before 19,500 BC by the Scorpion priest and presumably empowered by the Scorpion God.